If you’re in need of a wireless internet router, looking around the Amazon marketplace, you will notice one major thing… there are a ton of options. If you’re looking for a reasonably priced router, that you don't have to be an computer genius to set up, the N300 wireless router from Belkin may be perfect for you. In an average household, there may be 3 or 4 wifi enabled devices accessing the internet at the same time. Being able to handle the simultaneous stream of data without any lag or disconnections is one of the major concerns of the average consumer. You are in luck, this N300 excels in that workload. No one wants to be halfway through a Netflix binge session and have the wifi signal drop. Ease of setup is also very important since we all aren’t IT technicians that can diagnose the problems as they come up. It is important that anyone can set it up and make the wireless network available to everyone with a wireless device. 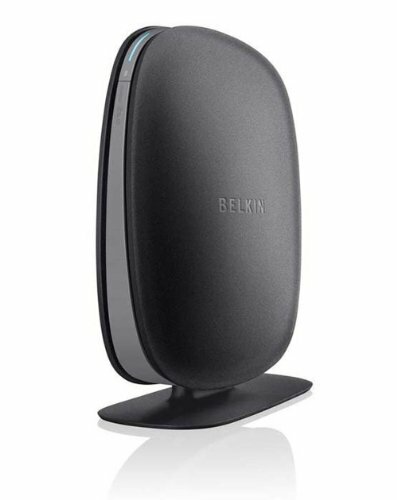 The N300 wireless router by Belkin makes having wireless internet throughout your home or business and attainable and easy. With 4 ethernet ports on the back, the N300 allows for multiple wired laptops or other devices to be connected to the router at the same time. Plus, the setup boils down to an easy 3 step process so you can jump into streaming, playing games, or checking your email within minutes. Weighing a miniscule 1.2 pounds and with dimensions of 2.7 inches by 9.12 inches by 7.5 inches, this little heavyweight wireless router won't be a hassle to move or take up a lot of space on your desk, bookshelf or wherever you may choose to put the router. If there is one overarching positive in selecting the Belkin N300 wireless router, it would be the ease of setting up the router for use in your home or office. If you are familiar with setting up wireless routers, some of the options out there take hours and diagnosing issues is a huge pain. Belkin put a lot of work into their 3 step process and it shows with the rave reviews the wireless router is getting. Being able to open the box, plug the device in and running a simple program from an included disk without hassles or headaches is time and time again the most common praise the Belkin N300 wireless router receives. Another bonus is the price. While some routers can run a consumer as much as a few hundred dollars, the N300 is a reasonably priced router which can be used in a home or business setting. While the Belkin N300 ease of use and price point offer the device some good bonuses in using the device, it can also have its issues. One of the more common issues that users tend to have with this product is connectivity. More than one customer reported having connectivity issue and having to restart the router from time to time. This behavior is pretty common with wireless routers and there are no competitors out there that can boast that they never have to be reset. Some owners have also reported lack of support from the manufacturer. While Belkin does offer owners a 2 year limited warranty and 24/7 support, some didn't find the support to be worth the purchase citing issues such as lack of availability and lack of knowledge to fix the error. This concern is also something that you are bound to find with all of the different manufacturers. If things go wrong it might be a hassle to get it setup through customer support. Overall, the Belkin N300 wireless router is a well built router that for a good price offers and easy setup and instant wifi access. While it does have some issues that can be evident in other router models, it is once again the ease of setup and the reasonable price that puts this router above the others in the market.